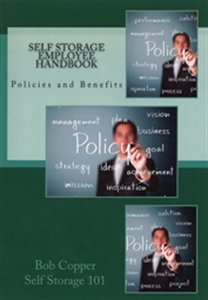 This employee handbook is a compilation of policies, procedures, working conditions and expectations established to guide staff and employer actions in the operation of a self-storage facility. It's a code of conduct that sets guidelines around appropriate behavior for working as part of the business. It also includes an at-will employee statement as well as information about employee compensation and benefits, and additional terms and conditions of employment. Note: While this comprehensive handbook addresses most aspects of the employee/employer relationship, there may be state-specific or other local issues that will affect your particular self-storage operation. It is the responsibility of the user to ensure compliance with any employment-related statutes relevant to their location.